The rise of automatic milking systems in the dairy industry has led to a new way of farming, eliminating the need to lock up cows in holding pens for hours waiting to be milked. Milking robots offer a way for cows to be cows and enjoy these five freedoms that help them to be at their best. freedom to display their natural behavior. What if we told you that we have a traffic system that will help give your cows the freedoms they deserve while helping you increase your production and reduce labor costs? It might seem too good to be true, but it’s within reach. Our free cow traffic system that we discovered some time before the turn of the century has proven to make cows feel happier, produce more milk and stay healthier. In addition, free cow traffic is easier for the farmer. Voluntary cow traffic ensures that cows can eat, drink, rest and be milked according to their own natural biorhythms, without human intervention. Giving your cows the ability to follow that natural biorhythm is essential to creating an environment where cows want to visit the milking robot. 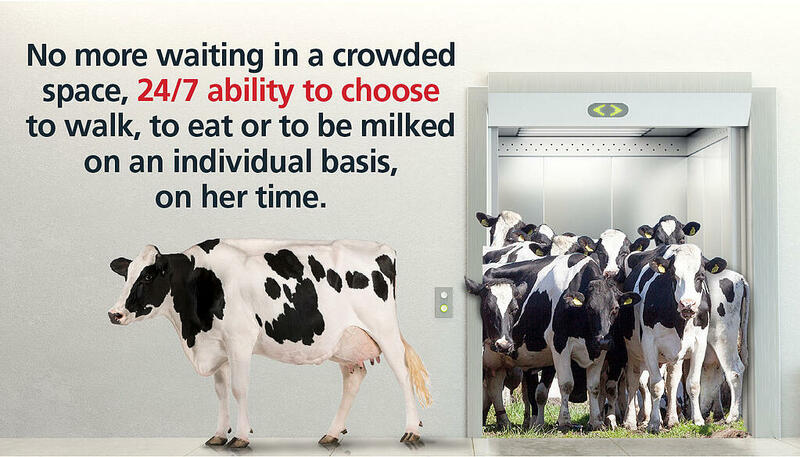 Cows that have to stand around in holding pens waiting for attentions will begin to feel harassed and threatened, causing them to become unwilling to visit the robot. Once you have to start forcing a cow to visit the robot, you will have to continue doing so. Free cow traffic has proven to add, on average, 2.2 lbs of milk per cow per day more than guided or forced cow traffic. Being in control of their own world makes the cow more comfortable and a healthy and a comfortable cow is a productive cow. Farmers who change over to free cow traffic are making a choice to provide their cows with the five freedoms they deserve, and by doing so, will get the most out of their herd.